Last week I visited a new WorkSource Center Satellite in South Los Angeles, where a Recovery Act investment by NTIA has funded 25 new computer stations that community members seeking jobs can use. Coupled with hands-on assistance and career counseling from trained personnel, this investment is creating economic opportunities in a neighborhood where poverty and unemployment rates are unacceptably high. All told, NTIA’s $7.5 million grant to the City of Los Angeles for its Computer Access Network (LA CAN) project – part of a $4 billion Recovery Act investment to expand broadband access and adoption in communities nationwide – will upgrade more than 180 public computer centers in some of the city’s neediest neighborhoods. The WorkSource Center Satellite is located with the Chicana Service Action Center, whose CEO, Sophia Esparza, told me how the project is preparing job-seekers, not for yesterday’s jobs, but for the “green jobs” of the future. Customers, including returning veterans and Temporary Assistance for Needy Families (TANF) recipients, are benefiting from strong partnerships between the city and local employers to place solar installers, energy auditors, lead green technicians and electrical auto technicians into well-paying jobs. This week construction began on a fiber-optic network that will bring broadband Internet service to more than 120 communities in western and north central Massachusetts. Thanks in large part to a $45.4 million Recovery Act investment from NTIA, the project will help residents and businesses in these underserved parts of the state to better compete in today’s knowledge-based economy. On Tuesday, I joined state and local officials, members of the project team at the Massachusetts Broadband Institute (a state-created organization that is our grantee), businesses, and others in the community to discuss the initiative, called MassBroadband 123. It will deploy broadband service to nearly 1,400 community anchor institutions, including schools, community colleges, libraries, healthcare providers, and public safety facilities – like the Sandisfield Fire Station where we met, and whose fire chief has emphasized the importance of up-to-date technology for keeping residents safe. As part of BTOP’s comprehensive oversight of its grant recipients, I recently spent several days in North Carolina conducting an on-site review of two broadband infrastructure projects. Local broadband provider MCNC received two BTOP grants that together will fund deployment of more than 2,000 miles of new fiber infrastructure. The new infrastructure will reach 69 counties and directly connect more than 500 community anchor institutions across the state, including universities, hospitals, and public safety facilities. 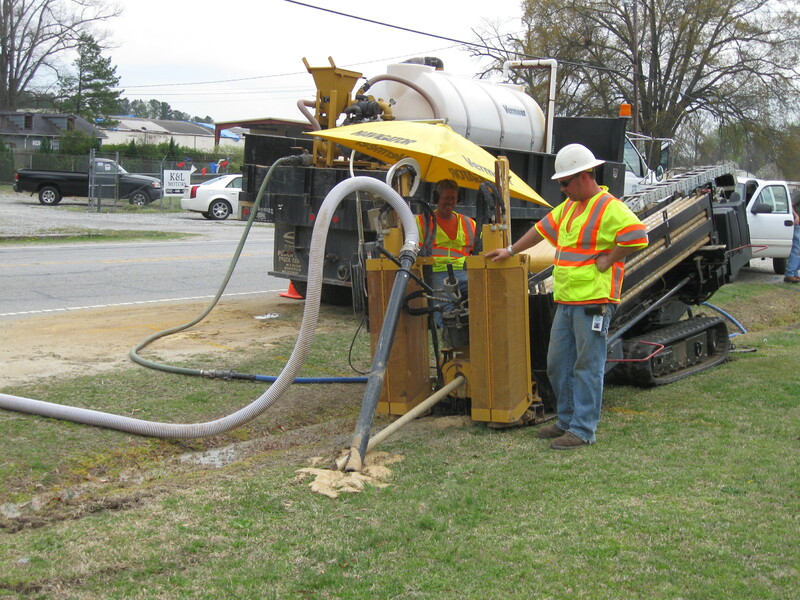 To date, MCNC has deployed more than 140 miles of conduit, with plans to begin running fiber-optic cable through the conduit in the coming weeks. During my visit, I examined MCNC’s project management approach, project status, grants management procedures, financial practices and controls, and compliance with BTOP and Recovery Act program requirements. My review included a productive series of meetings with MCNC that after two days of rolling up our sleeves yielded a better understanding of our shared objectives and the challenges associated with deploying and managing statewide projects. This month I had the honor of hosting our Federal, State and local partners as we formally kicked off the construction phase of the One Maryland: Inter-County Broadband Network (ICBN) Recovery Act funded-project. This project is important to me because it will allow the State of Maryland to bring sorely needed broadband resources to every corner of the State and foster cooperation across many layers of government. 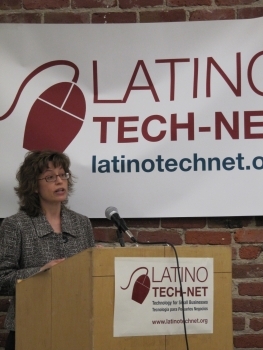 Broadband and the Latino Community: Let's Keep the Momentum Going! Yesterday I was happy to participate in a panel discussion about broadband at the National Association of Latino Elected and Appointed Officials (NALEO) annual conference in San Antonio. NALEO members recognize that broadband Internet is one of the tools necessary to help their communities thrive in today's economy. In fact, I think that any conference focused on building stronger communities should include a discussion of broadband - it's a critical ingredient for job creation, economic growth, and improving education, health care, and public safety. I talked about challenges and opportunities. NTIA's data show that although 90-95 percent of Americans live in areas with access to broadband, only 68 percent of households subscribe to the service. In fact, more than 28 percent of Americans do not use the Internet in any location, which means they are cut off from countless educational and job opportunities. The issue is even greater for Latinos. While the Internet subscribership rate for Hispanics increased by five percentage points last year, it is still only 45 percent. 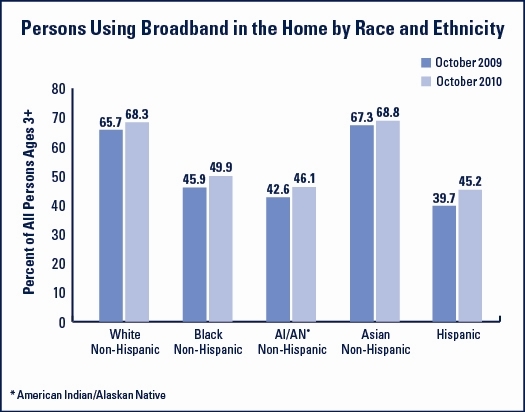 Even after adjusting for socioeconomic factors like income and education, Latinos still significantly lag the national rate in broadband adoption. Read more about Broadband and the Latino Community: Let's Keep the Momentum Going! Earlier this month, I saw firsthand the benefits of our sustainable broadband adoption projects when I attended a graduation ceremony in D.C. Byte Back, a BTOP grantee partner, held a ceremony for adults who completed computer and jobs-skills training courses. At the graduation I met students who showed me how these courses are enabling them to cross the digital divide and open doors to new opportunities. One of the graduating students was a mother who had to seek out her teenage daughter’s help in order to pass the course. Another graduate was a senior who came to the program when her computer broke. She enjoyed the courses so much that she is now a volunteer with the program, helping to teach other seniors valuable computer skills that can help them stay informed and connected. Several others were already finding ways to put their new skills to work and had lined up job opportunities. Resources and tools on the site can be used to teach and help develop digital literacy skills including lesson plans, online training tools, and train-the-trainer materials. In addition, any user can go to the site’s workforce page to connect to a wide variety of career-building applications that teach a range of skills including word processing fundamentals, resume -building tips, and job search techniques. Student union volunteers standing by? Check. Setting up a public computer center is no small task. Fortunately, one BTOP project, Philadelphia’s Freedom Rings, created a step-by-step account of a recent “Setup Day” for a local public computer center. The article details the steps the grantee and local community members took to get the center up and running and offers tips on items such as laying out the classroom, cataloging equipment, and installing an operating system. Public computer centers can be a lifeline for those who cannot afford a computer or Internet access at home. Many BTOP-funded public computer centers also provide training for people to develop the skills needed to use technology effectively and participate in the 21st century workforce. 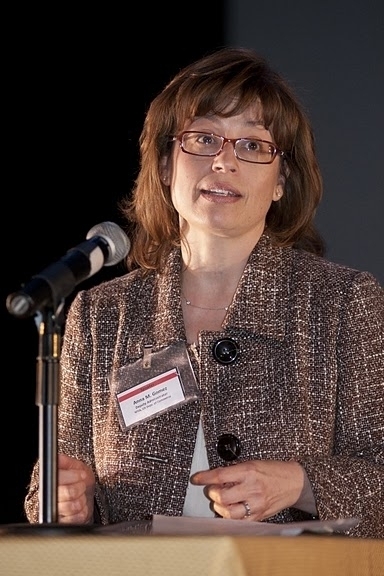 This account can be a helpful resource for other public computer grantees – or other groups that are developing their own computer centers. We encourage you to take a look at “How to Create a Public Computer Center” on the website of The New America Foundation's Open Technology Initiative, a contractor for the City of Philadelphia’s Freedom Rings project. By sharing best practices, BTOP grantees can leverage their efforts to benefit other grant recipients and the broader community going forward as we work to help close the digital divide. Congratulations to the volunteers and workers that participated in the Freedom Rings Setup Day!